From the makers of Antik Skate Boots! Super high grade of awesome roller skate wheels. That about covers it! See what the ‘lip’ can do for your game. The Reckless XE line adds a new durometer to the range of options, 91A. This new formula of Reckless wheels has better all around performance featuring even better grip, stronger cores, better durability and fancy new colors. The Reckless® 38 mm wheels provide skaters with a happy medium between narrow wheels for agility and wide wheels for stability, by giving you the benefits of both worlds. 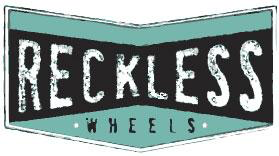 Reckless wheels give the skater a ‘lip’ that is needed for adding more stability, grip, and ‘snap’ at the end of your push. this revolutionary molded lip on a mid-width wheel is exclusive to reckless, and it will give you the advantage necessary to take your skating to the next level. The Reckless IKON wheels are the standard 62mm height and 38mm wide.